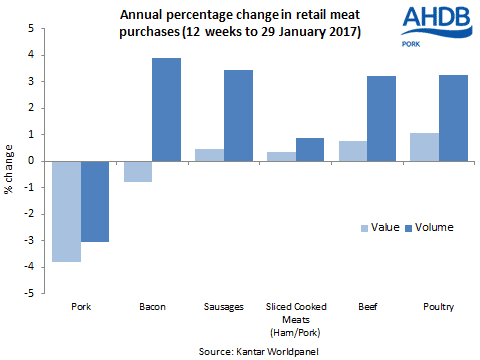 UK - Volumes of primary pork sold by UK retailers in the 12 weeks ending 29 January continued to be below year earlier levels, according to the latest data from Kantar Worldpanel. In contrast, added value products, such as sausages, showed sales growth year-on-year. The volume of fresh/frozen pork purchased during the period was 3 per cent down compared with a year earlier, despite average prices being back almost 1 per cent. Within this marinades saw a particularly sharp drop in sales of 29 per cent, whilst shoulder and loin roasting joints also saw double digit declines. However, not all cuts were affected by the fall, with leg roasting joints and belly showing increases in sales volumes that also translated into value. In contrast to pork, primary beef and poultry meat sales volumes increased year-on-year during the period. This was likely helped by a 2 per cent fall in average unit prices, though the value of these markets was still higher than a year earlier. In contrast, lamb prices continued to climb which negatively impacted sales; volumes were back 9 per cent on the year. The picture was more positive for added value pork products, which saw an increase in spend across the board. Prices of pork sausages and sliced cooked meats were below year earlier levels, but this was compensated by increased sales volumes. Conversely, a 7 per cent rise in the price of pork pies countered a small decrease in sales. Sausage rolls saw an increase in prices as well as sales volumes. Meanwhile, although volumes of bacon sold were 4 per cent higher than year earlier levels, falling prices meat that the value of sales was actually slightly back on the year.